Manny Pacquiao and Timothy Bradley have both agreed to fight each other again on April 12, the contracts have been signed for this eagerly awaited rematch between the pair where the boxing public felt that Pacman was robbed of a victory first time around. Top Rank promotions confirmed the bout on Saturday, Pacquiao agreed to fight last week and Bradley signed the contract yesterday. For Bradley to get the fight against the Filipino he needed to extend his current deal with Top Rank as he was due to become a promotional free agent at the end of the year. Pacman has been guaranteed $20 million dollars in revenue and $6 million for Bradley, while Pacquiao is taking a $6 million cut; Bradley will receive a $1 million increase on the last fight between the two. Manny will be looking for revenge on the return-bout and will go for stoppage to avoid a controversial decision like the first fight. Top Rank’s Bob Arum feels that Manny won the first fight, although he doesn’t agree with the decision that night. He says that it is yesterday’s news now and it’s time to move on. “My feeling is that if this were the next fight after their first fight then maybe the result would be really relevant,” Arum said. “But it’s a different Bradley now, having had that great fight with [Ruslan] Provodnikov and beating [Juan Manuel] Marquez. I sort of think what happened in the first fight, whether you think the result was just or unjust, is yesterday’s news. Pacman who has record of 55-5-2 with 38 knockouts, can redeem himself and settle the score at the MGM Grand, the same place as where the first fight took place. Bradley with a record of (31-0, 12 knockouts) will be defending his World Boxing Organization welterweight belt in the fight. 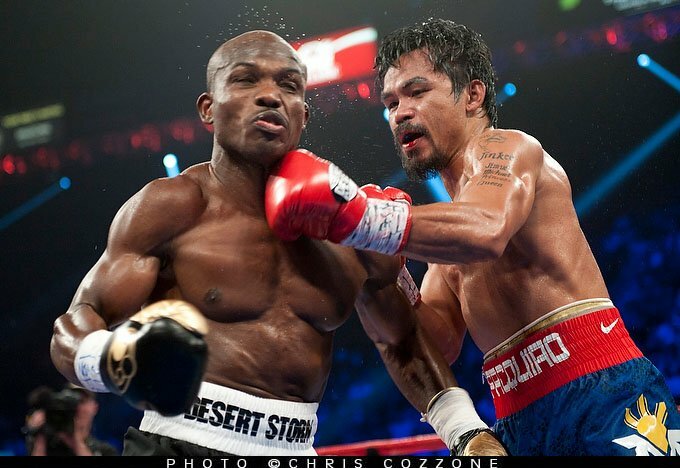 Since the Pacman victory, Bradley has gone on to defeat Juan Manuel Marquez and Russian brawler Ruslan Provodniko. Top Rank president Todd duBoef feels that he has improved since the Pacquiao fight.